MSM (Methylsulphonylmethane) MSM is a powerful, natural source of Sulphur. Sulphur is needed to form connective tissues and can be found naturally in fruits, vegetables, grains and in us the human body. 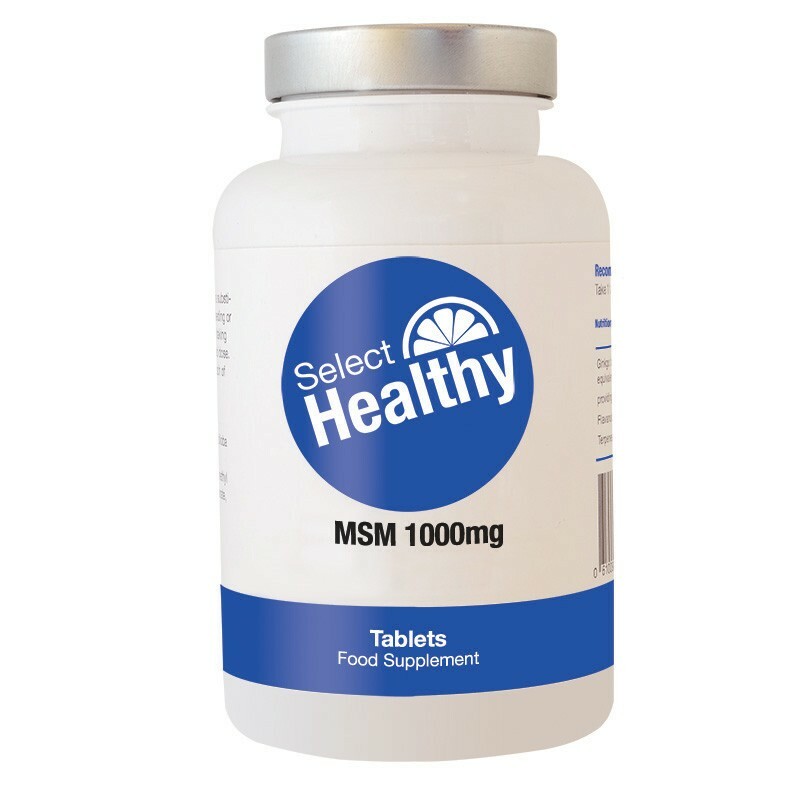 Each tablet contains 1000mg of MSM and is suitable for Vegetarians. Methyl Sulphonyl Methane, Dicalcium phosphate, Cross-Linked Carboxy Methyl Cellulose, Microcrystalline Cellulose, Polyvinyl Pyrrolidone, Hydroxy Propyl Methyl Cellulose, Magnesium Stearate (Vegetable Source), Colour: Titanium Dioxide, Glycerol, Talc. Food supplements should not be used as a substitute for a varied diet. If pregnant, breast feeding or on medication, consult your doctor before taking this product. Do not exceed recommended dose. Store in a cool dry place and out of the reach of children. I am a very happy customer, not only do your supplements work effectively but your prices are very affordable. Msm has helped to ease my joints, thank you. I have been taking MSM with Glucosamine 1000mg for about 2 months I have been very pleased with the results. My joints feel much more supple... very pleased. i play football twice a week and sadly my fitness and joints are not what they were, i started taking msm to help with joint stiffness and to improve recovery time so far so good. its really helped. For mt age i think i am doing extremely well, and i put it down to the good products from select healthy. MSM and Glucosamine work well for me it took a while to find an effective combination, but have it now and very happy. I take these tablets in conjunction with Glucosamine and Omega 3 fish oil to avoid having to take painkillers for osteoarthritis. It seems to work!! i used to take it alone but then was told that if i take it with glucosamine i would feel better results. the 2 together work even better. Affordable without compromising on quality, i take this with gluc and so far so good, good reduction in pain and improved mobility. Helped me with stiff aching joints, now have more freedom of movement. Select Healthy prices are unbeatable in my humble opinion. I take msm and glucosamine for effective relief from knee pain, both work well for me and have helped hugely.Select Healthy offer great value for high strength supplements that work. Took a while to work, but i suppose all good things come to those who wait. I used to suffer with bad leg cramps and msm has eased them considerably. MSM works well for me it has really made a difference to my mobillity, i am no spring chicken but for myI age i am doing pretty good.In fact some days i am very sprightly. I used to take glucosamine alone but found that msm and glucsamine together gave me more flexibility. this store offers value for money combined with quick delivery times,i wouldn't shop anywhere else. smooth and efficient service ,very happy would recommend. i was recently diagnosed with osteoporosis ,i have just ordered this with high hopes ,fingers crossed that it will do what it says on the tin,swift delivery and impressive prices.